Powers of Texas, Powers Boothe. Surely there are more powers in the great republic of Texas than can be listed in any single article, or even in any single book. 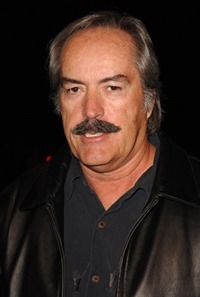 This is about one of them: Powers Boothe. Powers Boothe was born in Snyder on June 1st, 1948 to Merrill Vestal Boothe and Emily Kathryn Reeves. He attended Texas State University, San Marcos (then Southwest Texas State) where he was a member of the Lambda Chi Alpha fraternity and received his Master of Fine Arts from Southern Methodist University. Powers Boothe has long been one of America's finest actors in two major categories, character and leading man. He certainly showed a tremendous range when portraying that crazy, charismatic cult leader, Jim Jones (the "Mad Messiah") in the two-part television biography, "Guyana Tragedy: the Story of Jim Jones." Playing a man perceived by his followers to be Godlike, Jones persuaded 913 of his dedicated followers to commit mass suicide, and ordered the assassination of visiting journalists and a congressman. Playing such a complicated man could not have been a simple matter. And yet Boothe pulled it off so well with his nuanced performance that he was awarded an Emmy. Boothe plays such varied characters as Shakespeare's King Henry IV and Richard III onstage, and author Raymond Chandler's hard-boiled detective, Philip Marlow on television for three years; the traitor, John A. Walker, Jr., in "Family of Spies;" Alexander Haig in the movie "Nixon;" and the major role of gambler and con man Cy Tolliver on HBO's acclaimed series about the old West, "Deadwood." Like a true Texan, Powers Boothe brings authority and forcefulness to the characters he plays. He has said of the Tolliver character's dark side, "one of the interesting things about it is people, fans or whatever, will say to me, "Oh my god, you were so brutal to kill those kids." And I say, "Yeah, but did they deserve it?" And they all go, "Yes." So in one of David's [Milch] brilliant ways of writing, in the town [of Deadwood], one takes care of their own business, right? You are the law. Your own law." Boothe said in a February interview with IGN, that he was "crushed" when he learned "Deadwood" wasn't coming back " because I thought we had created -- David and the cast -- the most unique show on television. You know, "genius" is thrown around a lot, but there's not much question about David. And then, just on the business side, we had the second highest numbers [on HBO] to Sopranos, we had excellent foreign sales, excellent DVD sales… A critical hit, an artistic hit… What do you want? So I don't know what happened, but fortunately, we're supposed to do two more two-hour movies and kind of wrap it up, this summer. I hope we do that, because the audience deserves it. They really do." Boothe also portrays a main character on the mega hit series "24" that fans both love and hate -- Vice President Noah Daniels, giving Daniels a multi-faceted personality who's confident and determined one minute, and confused and insecure the next, rarely seeing eye-to-eye with the president. In his IGN interview, Boothe was asked "What was it like coming onboard such a huge show like [?24"]?" and he responded, "First of all, I was very flattered that they were interested in me and had written this role for me. It's quite different, coming off of Deadwood. But I met with these guys, and I really liked them. Obviously, I liked the show, and I just think they're very clever, and topical and obviously they're doing something right, because their audience runs the whole gamut from extremely left to extremely right. So I think the wisdom to put issues and problems out there, and let us get involved with it and solve it in our own way, or not, is really what drives the show. Along with just incredibly clever writing and great acting. Like I said, they were good enough to write this for me, and why not [do it]? Boothe has been married only once, to Pam Cole, since May 25,1969, and they have two children. Daughter Parisse, appeared with her father in several episodes of "Deadwood" and is now filming a comedy. Powers Boothe has a successful career and a successful marriage, a combination almost unheard of in the movie industry. That's what happens when you're one of the Powers of Texas.